As part of the IFA event this week in Berlin, Acer is announcing its Predator 21 X, the industry’s first desktop replacement notebook with a curved display. 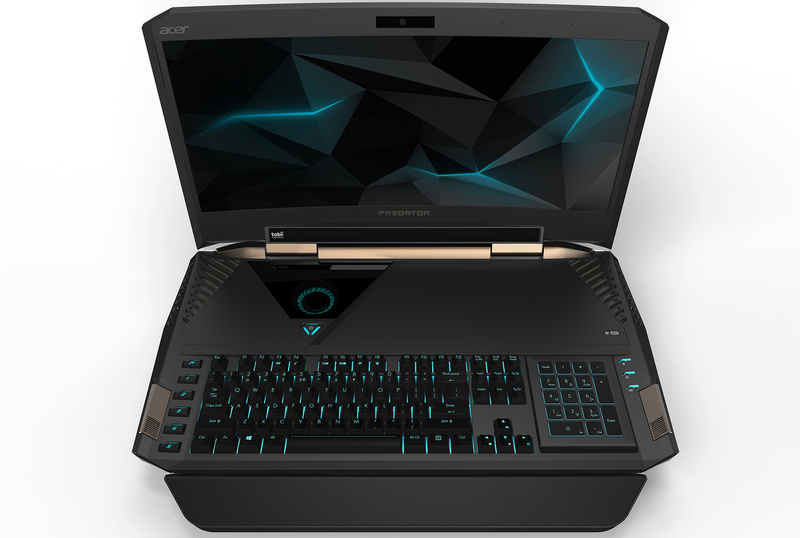 The laptop is aimed at gamers without budget constraints and packs high-end gaming hardware, such as Intel’s 7th Generation Kaby Lake processors, two NVIDIA’s GeForce GTX 1080 graphics cards in SLI and even a mechanical keyboard. The system can hardly be called a mobile computer because it is very large and heavy, but it still comes in clamshell form-factor and can be transported relatively easily. One of the key features is the display. The Acer Predator 21 X will be the company’s new flagship gaming notebook, which will feature a plethora of technologies that we have not seen in laptops so far. The machine will be based on Intel’s upcoming 7th generation Core processors codenamed Kaby Lake. Acer does not reveal exact CPU models or their specifications, but given the positioning of the notebook, expect the company to use chips designed for gaming PCs (45W+, one would imagine). For graphics, Acer plans to offer up to two NVIDIA GeForce GTX 1080 GPUs, but other options will probably be available as well. The company does not specify storage capabilities of the Predator 21 X, but chassis designed to fit a 21” display panel can integrate a number of M.2 and 2.5” drives. 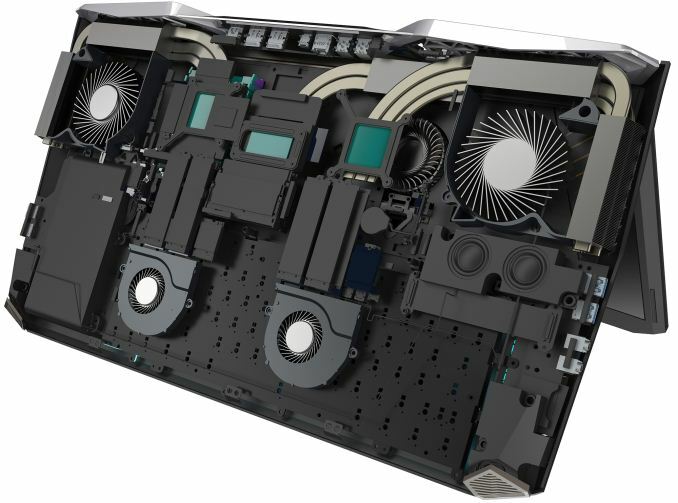 To cool down the CPU as well as up to two GPUs, Acer uses a specially designed cooling system with five fans and multiple heat-pipes. Three out of five fans are ultra-thin and are made of metal (the manufacturer calls them AeroBlade). 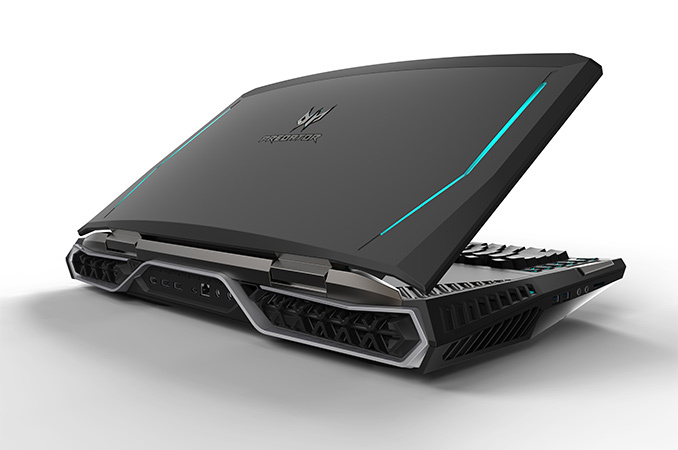 While the performance of the Predator 21 X promises to be high, the key feature of the notebook is its 21” curved IPS display panel with 2560 × 1080 resolution and NVIDIA’s G-Sync dynamic refresh rate technology. In addition to curvature, Acer also added Tobii infrared eye-tracking sensors to the display, which opens up different user experiences in games that support the appropriate tech. To further appeal to gamers, the DTR laptop comes with four integrated speakers and two built-in subwoofers (the audio sub-system carries the SoundPound 4.2+ brand name). For input, the Acer Predator 21 X uses a mechanical keyboard with Cherry MX switches (just like MSI’s GT80 Titan) with five programmable buttons. The numeric keypad does not feature mechanical switches, but a good news is that it can be flipped and turned into a touchpad (a device that some DTR gaming laptops lack). For connectivity, the Predator 21 X has one GbE port as well as a 2T2R 802.11ac + Bluetooth Wi-Fi module with two physical antennae on the rear side. In addition, the machine sports two USB Type-A ports, at least one USB Type-C receptacle, audio in/out as well as three display outputs (two DP, one HDMI). Since the Acer Predator 21 X seems to be based on Intel’s yet unannounced 45W+ 7th generation Core chips for gaming machines, it will not be available for purchase for at least several months from now. For this reason, Acer does not unwrap all of its specifications just yet because the spec is hardly final at this time. That said, it is impossible to even estimate an approximate price of the machine. Yet, it is safe to say that it will cost more than average gaming laptops not only because of two high-end graphics cards but also due to the unique display and form-factor. Just got done breaking into one of their offices, I stole one and scored 3200 in cash from a safe in the back, I'm in the -4000 demographic!